David Hobson joined Slow Food Aberdeen City and Shire in May 2016 and was elected onto the committee as Ark of Taste Liaison in July 2016, he has been a member of Slow Food UK for a number of years. 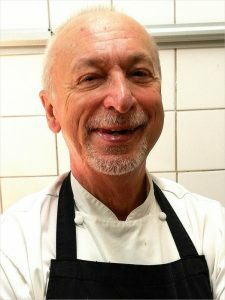 David Hobson is semi retired, he trained as a pharmacist and many of the processes he learnt in the dispensary have proved very useful in the kitchen. He held a wide range of management roles with a major chain before leaving to work as an outplacement consultant with oil and IT companies. David is passionate about all things Italian, especially its food, wine, food culture and history, and it is through his travels to Italy that he learnt about the Slow Food movement. David is an occasional cook at Oak cafe at St Mark’s church which raises funds for a variety of causes and also provides food to individuals who are homeless. Over the last ten years he taken a number of cookery lessons with a variety of tutors and in 2014 he completed a ten week online course called Science & Cooking: From Haute Cuisine to Soft Matter Science. The course is part of the MOOC programme run by HarvardX and was derived from the one week residential house available to Harvard undergraduates.